We started day 3 at the Qingyang Temple. As soon as I smelled the incense and saw the decorative iconography I began rummaging in my bag for a jacket to cover my bare arms. Our guide said it wasn’t necessary but I just felt uncomfortable walking around bare armed and tattooed in this ancient place of worship. My early childhood experiences of Eastern European Orthodoxy were rearing their oppressive heads – again. So I covered up, stepped over the threshold and entered the beautiful Taoist Temple. 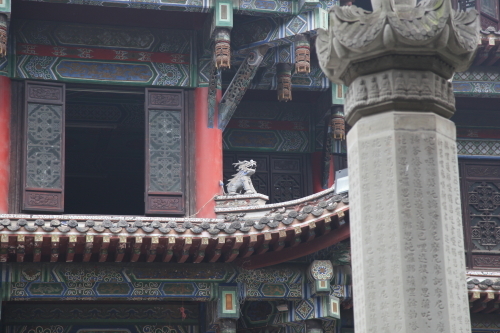 Qingyang Temple is small and intimate. Although much, much older than Eastern Orthodoxy, I’m surprised at how similar this place of worship feels. I smell incense, hear chanting and see images of fantastical deities and holy people. Food and drink are left as offerings and there is a quiet and peace all around. It doesn’t seem that different to the Orthodox Churches I remember from my youth. But the architecture is different. Pagodas, one of my favourite architectural forms, replace the Cathedral like structures I’m used to. The larger Wenshu Monastery is our next stop. This has a very different feel to me than Qingyang Temple. Although there is still incense, chanting and similar iconography, it doesn’t remind me at all of my youthful Orthodoxy. This is more what I was I expecting. Stunning pagodas, beautiful trees and a lake. The scenery is breathtaking and peaceful. 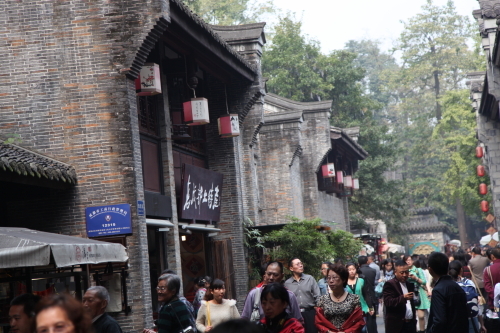 In direct contrast is the next place we visit, ancient Jinli Street. Bustling with people it is full of sound, colour and action. There is so much to see and do. 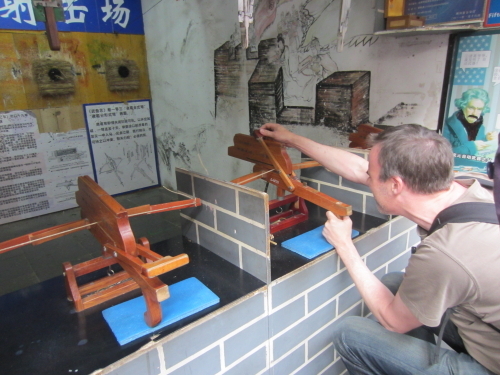 Paul was so excited when he found a shooting arcade featuring an ancient design, lever operated, repeating crossbow. He naturally had to give it a go! From the bustling Jinli Street we move onto the much quieter Tibetan Quarter. 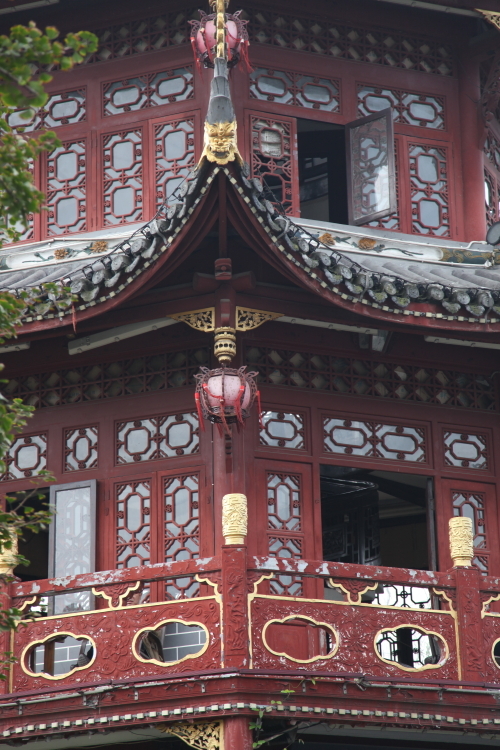 Chengdu is the gateway to Tibet so it’s not surprising it has a Tibetan Corner. The streets are dotted with shops selling traditional Tibetan wares and elaborate religious iconography. 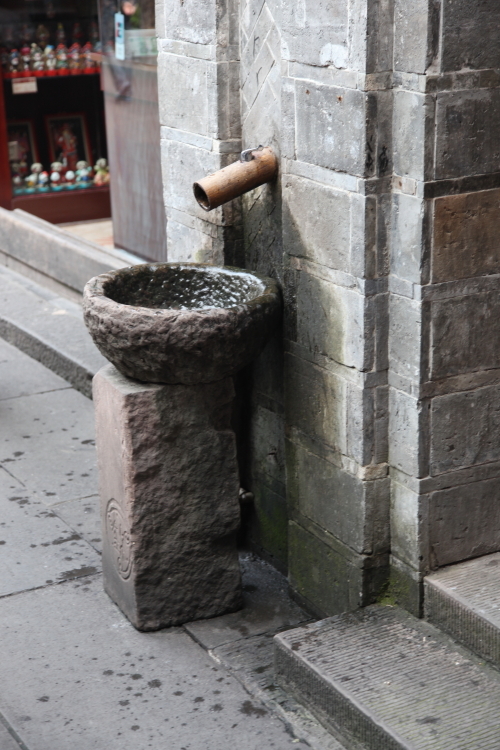 It is a very interesting part of Chengdu and well worth a visit. Our final stop for the day is Baihuatan Park. Unlike the People’s Park, Baihuatan is less crowded, quiet and tranquil. Bird life and butterflies are abundant. There is a delightful bonsai garden and a stunning pagoda perched near a river. After our exhilarating day it is a pleasure to just sit and observe nature. It makes me think I need to include more quiet time in my life back home. Hope you enjoy Day 4 & Day 5 panda filled days! I’m glad I’m writing about it now too. I remember Nobody Expects the Panda Kindergarten was in the mail while I was in China. I was so excited because I was going to get a credit for offering an alternate title name. I was so happy to see my name in one of your books. Now we are Cuppycake Collaborators! Never been to China but always wanted to go now thanks to you I will definitely make the trip, many thanks.